Have you been coveting the smart cover for the iPad 2? If you have the original iPad, I guess that is entirely possible, though there is no lack of covers and cases for that as well. Now if you have the iPhone, and you want something similar to the iPad 2’s smart cover, here is something that might catch your interest. It’s called the TidyTilt, and it is a Kickstarter project that has 20 days to go. Just like many cool accessories, the idea behind TidyTilt is rather simple. It has a three-fold function. One, it can keep your earbuds in a tidy little package. Two, it can hold your iPhone in a tilted position for better viewing on a flat surface. Three, it can mount your phone so that it stands on its own. How cool is that? The first function is brilliant, especially for people like me who always manages to get their earphones in a tangled mess. The second one can come in really handy if you browse or play games a lot on your iPhone. As for the third one, it will be very useful if you have a magnetic rack which mounts objects such as keys. TidyTilt comes in blue, pink, green, and black. TidyTilt is the brainchild of Zahra Tashakorinia and Derek Tarnow, who describe themselves as human-centered designers. Based out of Chicago, the two are setting out to fund their project by the 29th of this month. For a minimum pledge of $5, you can be part of the TidyTilt project. 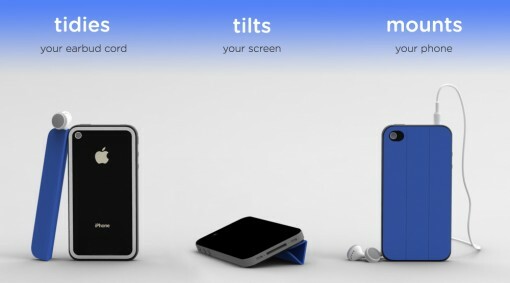 You have to pledge at least $19 to get a free TidyTilt (the blue one), though, and if you are not in the United States, you’ll have to add $10 for the shipping. Here’s a video showing you more about TidyTilt. If you want to help fund this nifty iPhone accessory, visit TidyTilt at Kickstarter.